Linen, a cloth which truly does have its own unique allure. My own personal love affair with the stuff started long before I became interested in sartorial menswear; I remember distinctly that I used to don some bizarre linen chinos in my early teens during the summer in an attempt to look edgy, matched with ghastly lumberjack checked shirts of the sort that appeals to confused and rebellious adolescents. 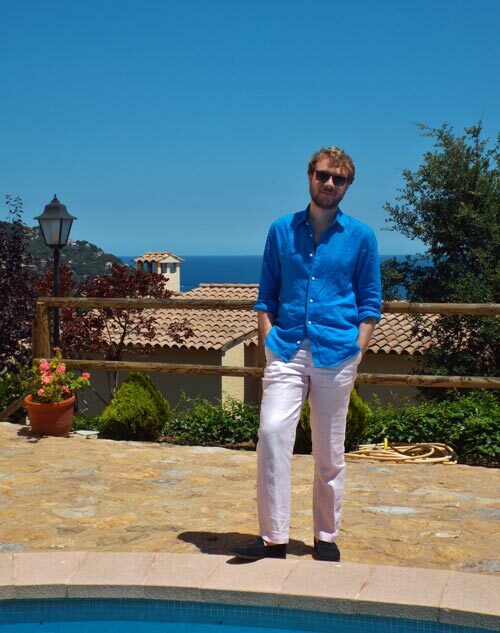 Today, with several years of engagement in sartorial style under my belt, I wear linen rather differently, but the underling appeal of linen cloths for summer has not changed. 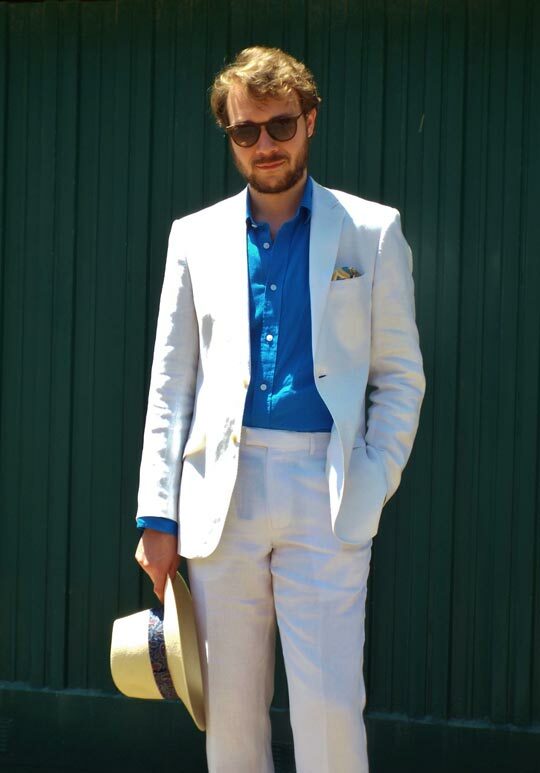 It is perhaps the quintessential summer cloth, at once debonair and dishevelled. There’s just something about a well-worn linen suit that conjures a highly romanticised view of tailored dress; a blend of Brideshead Revisited, the French Riviera, Expressionist painter and early twentieth century Bohemian, good quality linen tailoring creates an image of a man who offers the epitome of nonchalant, characterful and expressive summer style. Although I have written previously on the benefits of cotton and linen blends (this being something that I entirely stand by), in the heat of July and August when the heat is at its most intense, there are only two adequate options for tailored clothing; the lightest wool frescos of seven woven to eight ounces in weight, or similarly lightweight, open-weave linens. Linens have perhaps the greatest variation in quality of all commonly used tailoring fabrics, but in my experience, although more expensive and tightly woven linens press and launder better than cheaper variants, the tendency to crease incessantly during use remains the same regardless. That’s just how linen behaves. For this reason, linen tends not to make for durable business dress – it doesn’t remain crisp enough to provide a professional appearance suited to most business environments and quite obviously linen suits are not ideal for long-term commuting. This tendency to crease, combined with its floatiness, is however what gives linen its irresistible rakish charm for casual summer dress. Cut in a two piece suit it makes for a highly chic and relaxed lounge suit for summer soirees, and should be your quintessential port of call for luxurious holidays and impromptu weekend getaways. Likewise, there should be no end to your collection of linen blazers tucked away in the wardrobe for balmy summer days. Linen gives the opportunity to wear something which offers a great variety of colour and texture. Smooth linen and silk blended twill makes for luxurious suits, chunky linen herringbones or coarse basketweaves offer great mid-summer jacketing cloths and for the hottest climate, a pair of unlined plainweave linen trousers (such as those I’m wearing below) are the ultimate in convenient summer tailoring: light, airy and breathable. I wear such trousers all the time and they’re so comfortable in the heat they may as well be shorts. 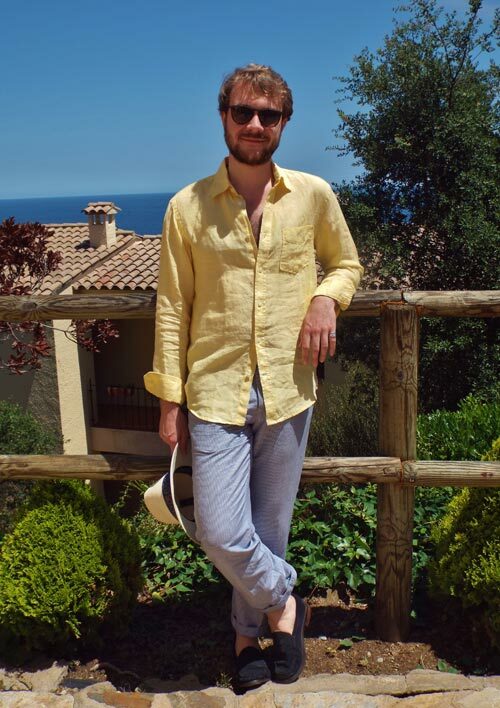 Similarly, there’s a real argument for suggesting that casual linen shirting provides the ultimate in chic holiday or even slick weekend style, matched with chinos or even (as I prefer) the aforementioned unlined linen trousers. Although the crumpled structure of linen is not something that will appeal to everyone, there is something effortless in its delightful floatiness that lends movement and a sense of breeziness to linen garments. Loosely cut shirts work particularly well, this being something I only just discovered as of a few weeks ago – having only ever really worn lightweight cotton poplins and oxfords in spring and summer – a decision I now regret, given how effortlessly dapper my linen shirting is proving to be. Indeed, wearing linen garments slightly more loosely than you might otherwise is the best way to channel this sense of suavity, given linen’s floaty structure. If you don’t give the cloth the room to drape and float a little, the effect is lost. Avoid narrow or close-cut linen trousers like the plague for this reason, ensure that the legs drape spaciously and wear with turn-ups to add a little weight to the trouser bottoms to aid their elegant ebb and flow around your ankles as your swagger down the seafront. I’d likewise suggest that with the exception of formal morning dress waistcoats (which are often cut in linen to save on weight and density in the summer sun), don’t bother with investing in waistcoats cut from linen; the cloth simply rides up and creases terribly following the natural shape of the torso, because it has no room to flow or drape around the chest and waist. Opt for generously proportioned half-lined and lightly structured summer blazers and trousers for the most comfortable ensembles. That’s all there is to it really. Linen is a real luxury to wear in the summer and its a luxury which is distinctly affordable. Throw a linen suit on in the morning with an open collar and swan around town all afternoon long. Its cool (in more ways than one), comfortable and supremely chic. Living down here in Texas, where we get about 60+ days > 100 degrees F, I am addicted to the stuff. That white/cream linen suit you are sporting is awesome, who made it? Thank you for your kind comments. Believe it or not the suit is a cheap one from Moss Bros (available in the UK but I’m not sure about the US) which cost me a piffling £160.00 and is still going strong two years and several holidays later. I did however have the suit fitted and changed the buttons to enhance its appearance, cream bespoke born buttons are infinitely better than cheap white plastic! What color undergarments do you wear underneath unlined linen trousers? I just bought one for myself and anything I wear underneath shows!